I can’t wait to see what the 2019 Lousiville Manufactured Homes Show has to offer this year. I’m expecting to see “Butler Kitchens”, New floorplans from Commodore & Sunshine, and the “New Ultimate Kitchen” from Champion. And of course I always love checking out new and old places that we have been before. I love archetectural and can’t wait to grab my camera and get some new shots. Ultimate Kitchen 3 continues the offerings that have built a reputation of sleek design and cutting-edge amenities. The latest edition provides more innovation, from its European-inspired industrial styling to its state-of-the-art conveniences. “The way we designed this package allows us to be very flexible. It can go into any home, any size, any configuration. We can make all of these beautiful new features work to the greatest of their ability in the space the customer most desires,” said Roberto Kritzer, Skyline Champion Corp.’s vice president of design. The Ultimate Kitchen from Champion has gained a dedicated following. Photo courtesy of Champion Homes. 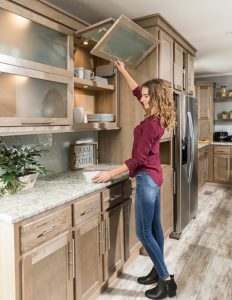 Champion floats stainless steel shelves for added storage space, as well as a raw, utilitarian look that contrasts nicely with the warmth of the Shaker-style cabinetry. The look continues its blend of texture and color with clean lines by assigning modern cabinet pulls, glass subway tile backsplash and stainless steel appliances from Whirlpool. “I’m excited about the all-new UK3 that our design team has created. They have integrated several trending features into this design that new homebuyers are looking for,” said Mark Yost, Skyline Champion’s executive vice president. UK3 boasts improved utility through ample storage space in the cabinets, drawers and cubbies. LED accent lighting behind the frosted glass of overhead cabinets opens the room with subtle hues that showcase the profile of nicely stored stemware. And, what would the offering be without that amazing farmhouse sink? The sink also has a designated straining basket, drying rack and cutting board. It contains a protective bottom rack to help prevent scratches. And the focal point of the sink is the black and brushed nickel faucet that provides the flex neck user experience. Kritzer said “less is more” remains at play, despite the introduction of so many new features. “We wanted to keep that open feel. The stainless steel shelves do this. And the nice blend between contemporary and modern, it works very well with the overall theme of clean lines and an open feel,” Kritzer said. “We managed to maintain the feel we wanted, but create a look that you really only have seen in very expensive kitchen configurations.